Little girls make the best helpers. 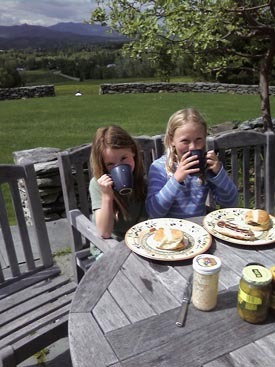 We live in Vermont full time, enjoying life in the historic village of Stowe with a snow-loving breed. It is 30 degrees Fahrenheit today and the sun is shining. Spring will soon be upon us. I’m very much house-bound with three March litters underway. The puppies from these first litters of 2019 are all committed by applications with deposits from some wonderful forever families. However, if you’re interested in a puppy later this year or next? I believe that we will have some availability. We are very soon going to take Rudolph and his sleigh off of the corner of the wraparound porch. While he has become a winter fixture, here in the village? Time is nigh to switch to wicker and think about Easter. We are now fully in quarantine and not able to accept visitors, as the puppies from our first litters of 2019 have begun arriving. Beautiful Billie! A US Top 20 TT in 2016 and a Westminster competitor in 2017 & 2019. With Karen Mammano at Westminster 2017. 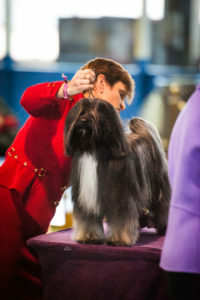 Billie Jean and Questa competed at Westminster in February 2019, a mother and son duo! Questa was awarded a ribbon and a medal for the Award of Merit, our first Westminster ribbon! Questa is currently back out with Rebecca Bradley, his handler. Becky has a budget for Questa for 2019 and one goal: Get him to #13 or better in the US breed point standings, so that he can match or beat his mother’s best performance of her career. If you’d like to learn more details about us? We would welcome hearing from you. Please introduce yourself! My wife and I lost our TT to cancer in early November and would like to get a TT puppy in the spring or early summer. We are friends with Karen Lewis and loved her new TT, Sophie, who we met yesterday. We would be deleriously happy to get one just like Sophie. We’d love to visit you in Stowe in the next few weeks if that would be convenient. Our home number is 802-893-2400 and my wife Carroll is usually there all day. My office number is 802-656-0207. It could be today. It might be tomorrow. Now is the time that I get nervous. On the one hand, I’ve always believed that being nervous heightens your ‘awareness’. I just wish that I could be in ‘heightened awareness’ mode, without being nervous! My dear friend Cheryl is here and my favorite vet tech on the planet will be arriving this afternoon. Gigi loves her vet tech and that might prompt her to go into labor. We shall see and we shall keep you posted! Enjoy this glorious weather. Happy weekend! We have had 5 Tibetan Terriers since 1978 and have two now. We want to get another Tibetan Terrier this year and we would like to be eligible for one of your girls or boys. We have always shown our dogs to become Champions and further the breed. Please let us know whether we can be considered. We lost a sweet and lovely tibetan recently. We can’t imagine finding a more fun-loving, loving, sweet dog again. I like what I see on your website, and would like to know when you have your next litter. I am so pleased to hear that Dennis has a puppy for you that will better meet your family’s time frame. Having walked in your shoes, I know how grieving feels. And when you feel ready for a new animal, I believe it is healthy to move forward. Good luck with your new baby! We are in the middle of preparations for the arrival of our first litter of 2016. It is a repeat breeding of my Gigi to my Oskar. I chose to repeat this breeding, as I liked so many of the characteristics and behaviours of the puppies from Gigi and Oskar’s first litter in 2014. This will be her third and final litter. All of the puppies have forever homes who’ve been eagerly awaiting their arrival. It is an exciting time and always finds me in a slightly nervous state. Our favorite vet tech will be arriving this afternoon for a visit and Gigi loves Jenifer. Her excitement may well stimulate contractions and then, the fun will truly begin. I look forward to continuing our discussion and would welcome you and your family for a visit to our home in Stowe, Vermont. Toward that end, I will leave the ball in your court . . . Thanks so much for the news! We are eager to hear more as you and Gigi progress! A beautiful weekend to be born! My husband and I lost our 18 year old tt in November. We still have our 13 year old tt who would love a companion. We would love to have a new puppy. We would ideally like a female brindle or gold/ white. Hello, We are very interested in getting a TT puppy. Male or female. Which ever would be the best fit . Love the double and tri colors. My best friends sister has a TT and she has the best disposition of any dog i’ve known. I would love to visit your facility in Vermont. Thank you for your consideration. My wife and I lost our beloved 10 year old TT Pandi to heart failure this past weekend, Oct 13 2018 and are ourselves now extremely heartbroken. I know that our future would be much brighter if we could add a TT to our lives in the future. Unfortunately the breeder we purchased Pandi from recently passed, (Lorraine Simon of Ketara Kennels, NJ), and I am exploring sources for a purchase in the summer of 2019. Ideally a Black and White coat TT but would consider any. Could you please let me know how best to pursue this through you. We are in Maryland, but would be more than happy to visit to make this happen. Thank you! Hi I am interested in getting a TT for my father for Christmas. I was wondering if you had any available or knew of someone in the Midwest area that had puppies available. Thank you! Hello. I am interested in a TT pup. I recently lost my golden doodle and would like to bring home a new breed. I live in CT with my husband and teenage sun who will be leaving for college soon. I look forward to hearing from you. My cell number is 203-980-5941. Hello, my name is jay Woodman, my wife and I just lost our Kerry blue terrier in November to lymphoma, he was a young dog of six. We are interested in one of your puppies in late spring / early summer. I would love to apply for one. We lost our beloved standard poodle to lymphoma on Christmas. Our five year old Havanese would like a tibetian terroir little brother or sister in Spring. My husband is a retired cetinarian from Chicago, so we understand and love our dogs.